The Gift of an Ordinary Day is a mother's account of raising her sons and what happens now that they are ready to leave the nest. The best way I can think of to put it is that it a book about growing up. The sons are growing, changing, becoming independent. The mother is trying to find who she is after years of being simply mom. How do you be a mom when your kids are leaving? This book really touched me. The author helps you to realize that is the ordinary moments in life, the ones we take for granted, that we need to treasure. As Katrina Kenison shares with us her relationships, her dreams, and her hopes for herself and her children, she speaks to every mothers heart. As the mother of an almost teenager I am beginning to see what people mean when they say that kids grow up in the blink of an eye. Wasn't it just yesterday that Tristen was toddling about? So, this book touched me deeply, as I realize my own children will be leaving us, sooner than I care to think about. I give it two thumbs up! Ramblings of a Texas Housewife Product Review and/or Giveaway Disclosure- I have received no compensation from Hatchette Book Group other than the offer of free product to review and/or giveaway. Any opinions expressed on Ramblings of a Texas Housewife are my own. My reviews are never reviewed or edited in any way by sponsors. Big thanks to Hatchette Book Group for providing me with 5 copies to giveaway to my readers! Comment on this post with why this book appeals to you. Please be sure to leave me a way to contact you if you win. Deadline to enter is 10/20/09 at 8:00pm CST. Winner will be announced and contacted on 10/21/09. Good luck! I would LOVE to have this book. My kids are younger, but reading your review, I think it would be insightful for the days ahead. My son is 11 and I'm already trying to figure out my life after he's graduated and gone! I'd LOVE to have this book! I would love to gift this book to a dear friend who is going through hard times. My kids are older and I would love to read another moms view on how to live through the empty nest syndrome. I think that this book touches the soul in every mother. It's the little things that stay with us and bless us. This book appeals to me because the memoir is my favorite genre, but also the name of the book grabbed me. I have been complaining lately because my three kids have been irritating me, but maybe I should just be grateful for an "ordinary day". gives ideas what to expect in the coming years. I would like to win this to give to my sister. Her boys are 18 and 16 years old and ready to move on, much to her dismay. I want to read this to remind myself to SLOW down!! My "baby" is a senior in High School this year! As a mother with a son I can relate. I would love to gain some insight from another perspective. My daughter is almost 21 and will be finishing college soon and I am sure the next steps for her will be getting a better paying job and moving out on her own. I am really not looking forward to that day, but maybe with reading this book, it will help me get through it. #1 Following you on twitter and tweeted. #2 Following you on twitter and tweeted. #1 Got you button on the bottom of my blog page. #2 Got you button on the bottom of my blog page. #3 Got you button on the bottom of my blog page. #4 Got you button on the bottom of my blog page. #5 Got you button on the bottom of my blog page. It appeals to me because I have 16 year old daughter and have thought about this subject for quite awhile now. This book appeals to me because I have a 16 year old son who isn't that far away from being an adult. Thanks! I'm a little scared of the teen years. This sounds like a great book to help me prepare for that...even though it seems so far off now, time really does fly. It interests me, because it talks about the my life now. For my neighbor an empty nester! This sounds like a book that can really put things in perspective. I have younger kids but sometimes I need a reminder to slow down and enjoy the little things in life. We are empty nesters-but this book looks insightful to the cotinued days alone! Then there is the breaks,sickess, or chages in life plans where you are no longer an empty nester!!! It appeals to me because she sounds like an average mom and it might help when my kids decide to leave the nest. I am pregnant with my first child and would like to hear about another mother's experience. 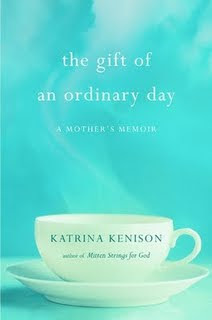 This book appeals to me because I did not think mother's had ordinary days. sounds like a book that i would love to read! This book appeals to me because I was just thinking about this subject today - the fact that we joke about not wanting our kids to live at home forever, but when they do leave the nest it is bittersweet. I think it appeals to me because i think everyday that my children aare getting older and that i want to be there for everything and not miss anything. I'm trying so hard to remember to apppreciate each day with my children because soon enough they will be grown up and gone and I'll wonder if I made the most of the time I had with them. Any one day or week can seem interminable, but the years fly by so fast. This book appeals to me because I would like to hear about others' experiences dealing with children growing up and leaving home.